The Mitten Crew: Another year of the "Smitten with the Mitten" series has come to a close. Thanks for visiting this cache and learning about Michigan Small Towns. Park is open from 7 AM to 10 PM. Cadillac is the county seat of Wexford County with a population of 10,355 at the 2010 census. Cadillac became the county seat after the so-called "Battle of Manton," in which a show of force was involved in enforcing a controversial decision to move the county seat from Manton. Although European explorers and traders visited the area since the 18th century, permanent white communities were not established until some time later. Initial settlements were connected with the logging industry. In 1871, Cadillac's first sawmill began operations. Originally called the Pioneer Mill. That same year the Clam Lake Canal Improvement and Construction Company was formed. Two years later, the Clam Lake Canal was constructed between Big and Little Clam lakes, present-day Lakes Mitchell and Cadillac. Sawmill owners used the canal to transport timber from Big Clam Lake to the mills and railroad sites. Cadillac was originally named Clam Lake and was incorporated as a village in 1874. The village was incorporated as a city in 1877 and renamed Cadillac, after Antoine Laumet de La Mothe, sieur de Cadillac, a Frenchman who made the first permanent settlement at Detroit in 1701. The Wexford County seat of government, originally located in Sherman, was moved to Manton in 1881, as the result of a compromise between the feuding residents of Cadillac and Sherman. Cadillac partisans, however, won the county seat by county-wide vote in April 1882. The day following the election a sheriff's posse left the city for Manton by special train to seize the county records. After arriving and collecting a portion of the materials, however, an angry crowd confronted the Cadillac men and drove them from the town. When the sheriff returned to Cadillac, a force consisting of several hundred armed men was assembled; this group reportedly included a brass band. The Sheriff's force, some of whom may have been intoxicated, traveled back to Manton to seize the remaining records. Although Manton residents confronted the Cadillac men and barricaded the courthouse, the posse successfully seized the documents and, in dubious glory, returned to Cadillac. In 1878, Ephraim Shay perfected his Shay locomotive, which was particularly effective in its ability to climb steep grades, maneuver sharp turns and manage imperfections in railroad tracks. Cadillac was home to the Michigan Iron Works Company, which manufactured the Shay locomotive for a short time in the early 1880s. It was however the lumber industry that continued to dominate the city, drawing in a large immigrant labor force, most of whom were Swedish (two of Cadillac's sister cities are Mölnlycke, Sweden, and Rovaniemi, Finland). In 1936, the U.S. Forest Service and the Civilian Conservation Corps created the Caberfae Ski Area, which led to promotion of the area as a tourist center. Caberfae remains in operation today, as the oldest ski resort in the midwest. Tourism has since become an important sector of Cadillac's economy. In the summer, tourists travel to the city for boating, fishing, hiking, mountain biking and camping. During the fall, hunting and color tours are popular. The winter is possibly the busiest season; the area can be found packed with downhill skiers, cross-country skiers, ice-fishers, snow-shoers and–most of all-snowmobilers. The North American Snowmobile Festival (NASF) is held on frozen Lake Cadillac every winter. Thirsty's, a gas station on M-55 west of Cadillac, was the home of Samantha or "Sam The Bear" from the 1970s through the late 1990s, when Sam died of old age. Sam was the only brown bear in captivity in the US at the time to hibernate naturally. Sam lived in a large cage in front of the gas station and was fed ice cream cones by tourists every summer. The 1,150-acre Lake Cadillac is entirely within the city limits. The larger, 2,580-acre Lake Mitchell is nearby on the west side of the city, with 1,760 feet of shoreline within the city's municipal boundary. The lakes were connected by a stream which was replaced in 1873 by the Clam Lake Canal. The canal was featured on Ripley's Believe It or Not in the 1970s due to the phenomenon that in winter the canal freezes before the lakes and then after the lakes freeze, the canal thaws and remains unfrozen for the rest of the winter. 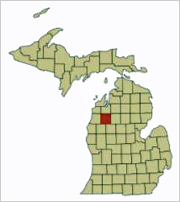 Cadillac sits on the eastern edge of the Manistee National Forest and the surrounding area is heavily wooded with mixed hardwood and conifer forests. A main agricultural industry in the area is Christmas tree farming. Cadillac was chosen in 1988 to donate the holiday tree to sit on the lawn of the U.S. Capitol building in Washington D.C.
During the winter months Lake Cadillac and Lake Mitchell freeze over and the city becomes covered with snow. Cadillac is connected to a number of trail systems heavily used by winter recreation enthusiasts, and the city itself integrates unusually well into the corridors of travel created by snowmobilers. Cadillac is also known as Chestnut Town, USA. The local area is home to a relatively large number of American chestnut trees, planted by pioneers from New York and Pennsylvania who settled in western Michigan. A blight in the early 20th century wiped out nearly every American Chestnut tree, but those in western Michigan developed a mysterious resistance and survived.